Air Socks can be of various shapes, dimensions, lengths, airflow distribution methods or suspension types. We make our products from various fabric types of different colors. We offer solutions for every situation that always correspond to demanding customer requirements. The standard shape, easy maintenance, preferentially recommended. For use where there is not enough space for circular diffuser and aesthetic applications. For use where there is not enough space for circular diffuser, in aesthetic applications and if the diffuser is to be installed in the corner of a room. Available if the room corner construction requires a different shape to quarter round. This shape requires a special suspension structure (provided) to clamp and support all corners. The triangular shape is maintained by placing a heavy weight at the bottom of the duct to maintain tension on the walls of the material. Individual parts are connecting with zippers; the number of zippers (or the distance between them) is flexible and can be specified by the customer. 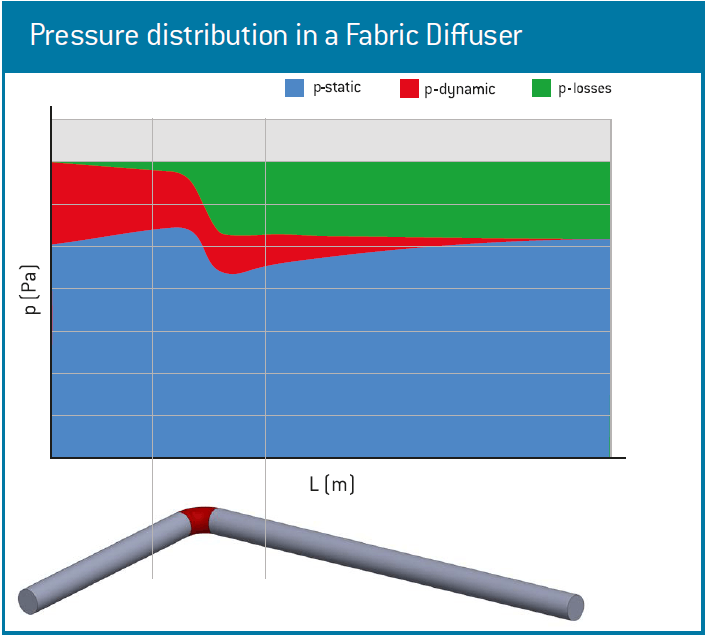 Pressure losses of Fabric Ducting & Diffusers are very similar to those in the traditional ducting. Calculating a more complex fabric distribution system is achieved using similar methods to those for sheet metal ducting. The minimum static pressure necessary to keep the correct shape of a Fabric Duct or Diffuser depends upon the weight of the fabric used. A minimum of 20 Pa is sufficient for light materials and 50 Pa necessary for medium and heavy ones. The pressure distribution along Fabric Diffusers is different from traditional sheet metal ducting because with declining airflow longitudinal velocity decreases. To verify the design of your fabric distribution system, please contact us.